Cuba is a country that has been looked upon in awe and mystery. The city’s streets appear as though they’ve been preserved in a time capsule, with classic cars, and lively musicians around every corner. But this country may soon be facing a drastic transition as the United States drops its hostile relations and welcomes Cuba with open arms. If you’ve always wanted to experience Cuba’s traditional way of life then 2015 is the year to do it, and these sights should definitely be on the itinerary. Located in Santa Clara, the Che Guevara Mausoleum holds the remains of the Marxist revolutionary, Che Guevara. The mausoleum is looked over by a 22 ft bronze statue of Guevara, who became an iconic figure of the Cuban revolution during the 1950s. Santa Clara was chosen as the location for Guevara’s burial as this is where Guevara’s troops took the city in 1958 Battle of Santa Clara. Built in 1589, the Morro Castle is a fortress guarding the entrance to Havana Bay, constructed under Spanish ruling. As you walk around you can inspect rusting canons, and places your hands on walls which have stood for centuries. Discover how the castle was once used and what mechanisms and strategies were adopted. You can climb the steps of a small turret to get a view of the sea, and imagine what it must have felt like to see battle ships coming straight towards the harbour. Whilst you’re in Havana, it’s worth gazing upon the monument of Vladimir Lenin, the founder of the Communist Party in Russia. This was the first monument of Lenin outside the USSR, renamed Colina Lenin in 1924 after an olive tree was planted to pay homage to his memory. There is also an exhibition hall that displays photos of Lenin throughout his life. This magnificent building has a striking resemblance to the Capitol building in Washington, USA. 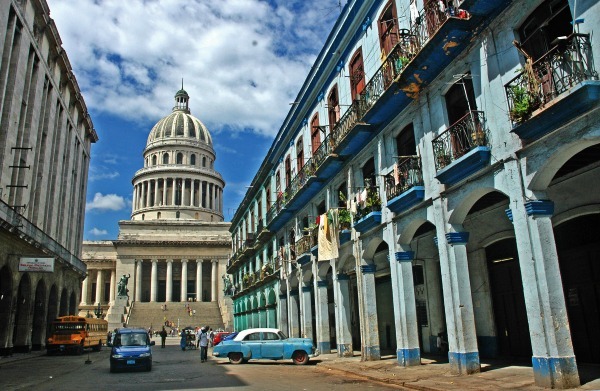 Once standing as the seat of government in Cuba, this building was left deserted after the 1959 Cuban Revolution. This is where you can also find the third largest indoor statue in the world, and is now used as a public library. Also known as ‘Revolution Square’, this was the heart of the communist uprising, and is where many political rallies were held, and speeches by Fidel Castro and other political figures were heard. The square lies in the shadow of the 360ft Jose Marti Memorial, a national hero in Cuba as a successful poet, writer and nationalist leader. Opposite the memorial are images of the famous Che Guevara and Cuban revolutionary, Camilo Cienfuegos. This is also where most political buildings are located.